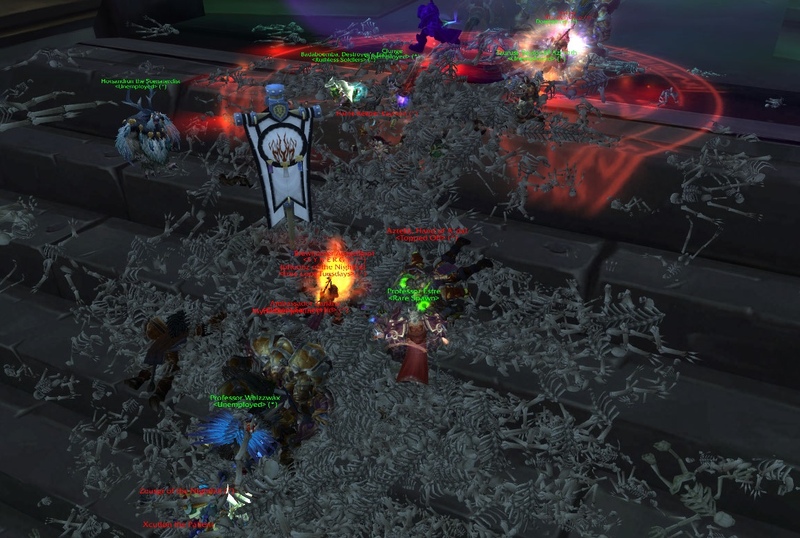 You may have had to run knee-deep in skeletons when visiting some of the older instances from time to time, if you play on a PVP realm. An excellent example is Halls of Lightning in Storm Peaks. These are the hotspots where gold farmers like to make their gold by using 3rd party programs. How much are they making in Halls of Lightning? Can you do it too, without bots? middle entrance takes you to Ulduar. Leftmost leads to Halls of Stone. Most of the bots that farm wow gold in this instance are level 83-88, as it's a level 80 instance. They prefer the normal mode, so they can continuously farm it throughout the day. Their favoured class is the paladin, a great solo farming class, especially in protection spec. Now I haven't inspected this instance thoroughly, but I haven't found any clever tricks here. I would assume they are just farming the mobs here and resetting the instance at a certain point. The first room alone has 5 packs of mobs and some extras, but farming only them and resetting would bring downtime, as there's a limit of 5 on how many instances you can clear per hour. Keep in mind that botting is against WoW's EULA, so should you want to attempt this, you should do it like I did, manually. It's faster and more profitable! Halls of Lightning is a straight forward instance that offers a few good sources of gold. The main item you're finding here is Frostweave Cloth. It's very valuable now that no one bothers to farm it usually. You'll also get a ton of relics, but they're not as valuable. Tip: To get even more frostweave cloth, a toon should have the cloth scavenging perk from tailoring. I tested their method and cleared the instance in 8 minutes as a level 90, killing every mob in the instance, and scavenged the constructs with engineering. I did not have tailoring. As a level 90 you can basically do the instance with just one pull. Though there's a door blocking until a boss is killed and some mobs like to leash, so at least 3 pulls is recommended. You'll also need a tanking spec for massive pulls. The total amount of wow gold gained from those items was about 482. If I turn the frostweave into bags, I can make a LOT more. On the second run I obtained 337 wow gold instead, and on the third run 491 wow gold. So it's quite profitable even if you don't find anything special. A bot run takes a lot longer than 8 minutes, so they will never hit the 5 instances per hour cap. There's a vendor and repair npc just outside the instance, so it's a very short break when one needs to repair. However, bots just vendor their loot, except maybe valuable trade goods. Still, the amount of gold they make per run is almost the same, as there's no point disenchanting wotlk greenies or blues. It's always more profitable to vendor them instead, at least on most realms. This instance's blue BOEs are more complicated. Sometimes you get 0 and sometimes 6 in a row. They offer nice stats, but pale in comparison to same level boe items from Cataclysm. That said, they are very hard to sell, but still sell for 50-100 wow gold should you find a buyer. Often it's a better idea to just vendor them, especially if it's a weapon that has high AH fees and a good vendor price. Gold Making contest is over! Two winners should receive a notification within 24 hours. One mount and two pets was won. Check your PM on the Loot Hunter forum and follow the instructions if you participated. Also let me know if I should publish your name here. One winner had to be disqualified though, because the winner gold making tip was removed by the user. I'll hold another contest at some point to give the extra item and some other freebies out!